1973 Studied in Design department at Osaka University of Arts. 1980-1981 Lived in the United States. 1982 Studied ‘Environmental Sculpture’ in Vancouver. 1995 Studied in Belgium with the subsidy by the government. Studied in Frans Masereel Center. 2005 Studied in Sweden with the subsidy by the government. Invited from Sweden and Denmark. 1979 “Drawing Performance”, New York, U.S.A.
“Drawing of the sea”, Liverpool, UK. 1980 “A Clay Work Project”, Calgary, Canada. “Sea Drawing”, Los Angeles/San Francisco, U.S.A.
1981 “New York Sound Drawing”, New York, U.S.A.
1983 “Rain Printing”, BOX Gallery, Los Angeles, U.S.A.
“Painting and Drawing”, Los Angeles U.S.A.
1984 “A Clay Work Project”, Canadian Rockies, Canada. 1990 “A Clay Work Project”, Stuttgart, Germany. “A Clay Work Project”, Wales, U.K.
1996 “Sound of the Moon”, Tielen Lichtaart, Belgium / Eindhoven, Holland. “Luisteren neer de wind”, Gallery Kaze, Osaka. “Experimental Music of John Cage and the study”, Shertogenbosch, Holland/Antwerp, Belgium. “Works in Belgium”, Frans Masereel Gallery, Kasterlee, Belgium. 1997 “Geluid van wind−Primal Scene of the Sound”, Galerie Ando, Tokyo. “Geluid van nul−Sound of Zero”, Habitat Gallery, Tokyo. “Sound from Zero”, Gallery Kaze, Osaka. “Sound of Nature A DEFORCE+S.RENSHAW Collaboration”, Kyoto. 1998 “Geluid van het hout−Sound of Wood”, Galerie Ando, Tokyo. 1999 “De zwaarkoffer 48e − the sky in the territory”, Galerie Ando, Tokyo. “Nature Wonderland by Takeshi Shinohara”, International Youth Park, Aichi. “Territory of Space and Visual”, Gallery Kaze, Osaka. “Territory of Space”, Rihga Royal Gallery, Osaka. 2000 “Works in Flanders“, Gent, Belgium/ Eindhoven, Holland. “Hoewel het onmogelijk is,moet ik het proberen- Paradox of Twins”. Galerie Ando, Tokyo. “Te ter aan vertrekpunt”, Damme, Belgium/Rengenbosch, Holland. 2001 “TIDAL WAVE−Traveling toward the ray of light", Galerie Ando, Tokyo. 2002 “Percolation +the principles of equivalence/water mark-series”, Galerie Ando/ Gallery Apa, Aichi. “ Haase of the Moon”, F.M.S. Gallery, Kasterlee, Belgium. 2003 “Circulation+Undulation”, Galerie Ando, Tokyo. 2004 “De waarde van een plaats− Value of Realm”, Galerie Ando, Tokyo. 2005 “CONVERTEERBAARHEID VAN PLAATS EN KWANTITEIT−N°O1 Convertibility of Field and Quantity No.1“, Galerie Ando, Tokyo. “OMVADLNG AV PLATS OCH KWANTIET” , A°lga°rden konstna¨rernas Museum,Sweden. “ OMVADLNG AV PLATS OCH KVANTITET”, En Tangsogade 4 udstilling, Denmark. “OMVADLNG AV PLATS OCH KVANTITET”, Bora° Bridge, Sweden/Denmark. 2006“CONVERTEERBAARHEID VAN PLAATS EN KWANTITEIT−N°O2 Convertibility of Field and Quantity No.2”, Galerie Ando,Tokyo. “Takeshi Shinohara− Biotope Shelter”, Minokamo City Museum, Gifu. “CONVERTEERBAARHEID VAN PLAATS EN KWANTITEIT Convertibility of Field and Quantity”, Gallery Ray, Aichi. 2007 “CONVERTEERBAARHEID VAN PLAATS EN KWANTITEIT−N°O3　Convertibility of Place and Quantity No.3”. Galerie Ando, Tokyo. 2008 “WHITE NOISE” Galerie Ando, Tokyo. “behind the seen − Secrets of Artistic Creation”, Tokyo University Komaba Museum, Tokyo. 2009 “WHITE NOISE Contemplated retroactive concept”, Galerie Ando, Tokyo. 2010 “CONVERTEERBAARHEID�VAN PLAATS EN KWANTITEIT”. Galerie Ando, Tokyo. 2011 “buds in helsinki ” Galerie Ando, Tokyo. 2012 " Leva-me pra Lua " Galerie Ando, Tokyo. 1979 Awarded at “Contemporary Print Competition”, Osaka Contemporary Art Center, Osaka. 1980 “Exhibition of International Print Biennale Krakau”, ?odzi Museum of Art, Poland. 1981 Awarded the grand prize at “Kyoto Arts Exhibition”, Kyoto Prefectural Center for Arts & Culture,Kyoto. Awarded at “Seibu Museum of Art Print Grand Prix Exhibition”, Seibu Museum of Art, Tokyo. Awarded Sponsor Prize at “Rose Garden Art Contest”, Rose Garden Gallery, Mie. 1983 “ Premio international Biella Biennale”, Museo Biellese, Italy. Awarded at “International Biennale Exhibition of Prints in Seoul”, National Museum of Contemporary Art, Seoul, Korea. “International Contemporary Print Art Exhibition”, Seoul Museum of Art, Korea. 1984 “Contemporary Printing”, Photorio Gallery, Australia. “Art Now ‘84”, Hyogo Prefectural Museum of Art, Hyogo. 1985 “International Biennale for Young Artists”, Neerpelt City Museum, Belgium. “Biennial of Graphic Art Ljubliana”, International Centre of Graphic Arts, Slovenia. “Contemporary Art Exhibition”, U.S.A., U.K.
“Dommelhof International Biennale”, Neerpelt City Museum, Belgium. “?odzi International Print Biennale”, ?odzi Museum of Art, Poland. 1986 “California Art Exhibition”, California, U.S.A.
“Contemporary Print Exhibition”, London / Liverpool, U.K.
“Vancouver EXPO ’86”, Vancouver, Canada. “Art Basel − the International Art Show”, Basel, Switzerland. “International Contemporary Art Exhibition”, New York GM Gallery, U.S.A.
1987 Budapest International “Art of Today” Exhibition, Budapest Galeria, Hungary. “Gubin International Paper Biennale”, Gubin Museum, Poland. “Contemporary Art exhibition”, British Museum, U.K.
1988 “Biennial of Graphic Art Ljubliana”, International Centre of Graphic Arts, Slovenia. “Contemporary Art Exhibition”, New York/ Washington DC, U.S.A.
1992 “Medium Duo”, Glasburn Museum, Rumania. 1993 “International Contemporary Art Fair ‘93”, Pacifico Yokohama, Kanagawa. 1994 “Track of Contemporary Art for 20 years”, Osaka Contemporary Art Center, Osaka. 1995 “Frans Masereel Center Graphic Fair”, Kasterlee, Belgium. 1997 “Tokyo International Contemporary Art Fair”, Tokyo Big Sight, Tokyo. “Obra Grafica Exhibition”, Caja de Asturias, Spain. “Warmth and Sound of Wood”, NHK / BS TV program. Concert “The music of John Cage”, Tokyo Junshin Women's College Gallery, Tokyo. 1999 “Tokyo International Contemporary Art Fair”, Tokyo International Forum, Tokyo. “Xmas with Art’99”, Bunkamura Gallery, Tokyo. “Nagoya Contemporary Art Fair”, Citizen Gallery, Nagoya. 2000 “Project of Japanese Garden and Handrail from Approach”, Ashiya, Hyogo. 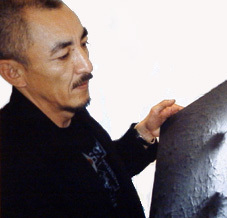 2001 “Artists in Residence in Mino−Mino Paper Art Village Project”, Gifu. 2006 “Aichi Prefectural Museum of Art Collection”, Aichi. 2007 “Cycle and Recycle”, Aichi Prefectural Museum of Art, Aichi. 2008 “Track of Contemporary Art in North Europe”, Nees, Denmark. 2009 “ET4U Contemporary Art Exhibition”, En Tangsogade 4 udstilling, Denmark. 2012 "ANDO SESSION -1 Drawing Exhibition" Galerie Ando, Tokyo.